The ringmaster leaps out into the center of the circus tent and throws his arms out as he beams up at the audience. He is dressed head-to-toe in an outfit of fire-engine red and gleaming gold scrollwork. His tophat is so tall its a wonder how he holds his head up. Out from the edge of the performance area walks a clown. If he can be called a clown. He wears a dark grey business suit which wouldn’t look out of place on bank manager, save for a patches of washed out pastel cloth sewn randomly across its surface. Their shabbiness stands in stark contrast to the otherwise crisp suit. He walks out to the center of the tent, struggling to drag a large trunk. It takes him over a minute to get to the middle. Long enough for the audience to begin to shift in their seats and mutter to each other. Once there, the clown unfolds the trunk into a table. He carefully hangs a banner in along the front of the table that states, in brightly colored but faded print, The Amazing Magnifico. The clown reaches under the table and begins to pull out fifteen or so wine glasses. He juggles them in groups of four or five in a half-hearted way before placing them on the table. He pulls out a pitcher and pours various colored liquids into the glasses. Then he begins to rub his finger along the glasses’ rims. It plays a discordant and somewhat unpleasant tune. It goes on for several minutes. He stops for almost 20 seconds. The audience believes he is finished. Then he stares fixedly at the glasses, adjusts the liquid levels, and resumes playing. In the audience, children tug on their parents pant legs and ask when the elephants are going to come out. A number of people walk out of the tent. Some of them are going to the bathroom, hoping that when they get back this supposed clown will be gone. Some of them aren’t coming back. When the song, if you can call it that, is finished, the Amazing Magnifico picks up each glass and drains the liquid from it into his mouth. He makes a disgusted face as he does so. Then he packs up his glasses, sighs, and drags his heavy trunk off of the stage. There is a bit of scattered applause. 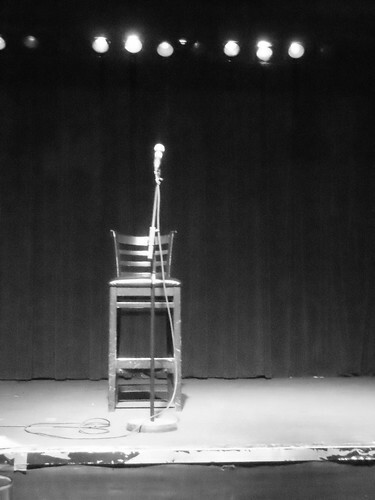 A poet steps off a dimly lit stage, and a man in a black shirt walks on. A scraping sound echoes from the side of the stage. A man walks out, dragging a huge black trunk. His heavily made-up face is mask of frustration and resignation. The trunk is too big for him. He doesn’t want to be here, but what choice does he have? Over a long, agonized minute he drags the trunk to the center of the stage. He stands up straight, and for the first time the audience gets a good look at his outfit. Is it a business suit, or a clown suit? The outfit doesn’t seem to know, and so neither does the clown. He just dressed up for work. He wore what he was supposed to wear, even if it didn’t make any sense. His makeup is applied carefully. The circles around his eyes are perfect. The white foundation covers everything, and it evens his skin tone into flawlessness. It is impossible to see the real color of his skin. Underneath the layers of paint, he could be anyone. Or no one. The lipstick suggests the smallest of smiles. A smile that is always there. Put there deliberately. It isn’t real, it isn’t warm, and it doesn’t reach his eyes. But at least he’s smiling. The clown…or businessman? opens up his trunk into a table. He hangs a banner along the front that says The Amazing Magnifico in faded color. It is obvious how bright and flashy the banner used to be, and it is obvious how much they have faded. The person who made this banner wanted to make an impression. The person who made this banner cared. That was a long time ago. Magnifico pulls what look like fine crystal glasses from the trunk and begins to juggle them. His technique is amazing. This is a master of the craft of juggling. At the same time, there is as much weariness as grace in the performance. And not a single gram of passion. His face is neutral, and he doesn’t appear to be paying any attention to what he is doing. He isn’t watching the glasses or looking at the audience. He’s staring off. His mind is somewhere else. Thinking about his mortgage, maybe. Or his impending divorce. A good performer is supposed to make you forget about the world. But how can he, when he can’t forget? He places the glasses down on the table. He pulls out more and juggles them, too, before putting them down. He pulls out a pitcher and pours colored liquid into the glasses. Different colors come out of the same pitcher. A magic trick. With just a hint of showmanship it could be dazzling. It is barely noticeable. He is very careful with the liquid levels. For the first time he seems to care about what he is doing. He places his fingers on the top of two glasses and begins to play. It isn’t beautiful music. It is discordant and unpleasant. It is what nails on a chalkboard would sound like, if they were lovingly and meticulously calibrated into an instrument. It isn’t beautiful music. But it is beautiful. It is a symphony of sadness and meaningless perfection. Right next to the cringe-worthy dissonance is a flawless expression of both expertise and helplessness. This is a man who has studied music. This is a man who has practiced a craft no one else in the world could ever care about until he was its one and only master. Every sound is deliberate. Everything that explains the patched clothing and the badly-dyed hair and the faded banner is expressed, to those in the audience with the ear and the temperament to hear them It isn’t all of them. But it’s enough. Several minutes later he stops. He stares down at his instruments. He adjusts the water level. He moves them around. Apparently they weren’t right. They weren’t perfect. He begins again. When he finishes he looks up at the audience. They stare back at him in silence. He picks up one of the glasses and throws it back. Like a shot of cheap whiskey. He grimaces at the taste. He stares down at the rest of the glasses. He picks the next one and throws it back. Then the next. His face says he is disgusted by what he is doing. Disgusted at himself. But what else can he do? He drinks down the bitter, candy-colored brew, one by one, until they are gone. There is a critic in the audience. He isn’t moved to tears. Of course he isn’t. He’s been in the game for a long, long time. His review of the even comes out two weeks later. He talks about the poet, and the singer, and the other artist who performed that night. But mostly he speaks about the Amazing Magnifico. That’s the performance, he says, that stayed with him.A performance the likes of which he has never seen before. He writes how the audience was captivated.